Iceland’s rugged volcanic landscape, dramatic waterfalls and ethereal Northern Lights make it a must-visit destination for anyone who loves nature. This short break offers a chance to explore the sights on the countries famous Ring Road and spend the nights keeping watch for the Aurora. Travelling with an astronomer ensures an understanding of the beauty of Iceland’s night sky and the natural phenomena of the Aurora Borealis. Iceland’s landscape is pristine and during the trip our local guides ensure that all rubbish is disposed of in a responsible way so we don’t leave a mark on the landscape. We encourage the use of reusable water bottles throughout the trip to decrease the amount of plastic waste we create. In Iceland there is absolutely no need to consume water in plastic bottles as the drinking water is so fresh and clean and therefore customers are urged to drink tap water and refill from these sources. In addition to the above, we are continually looking for ways to improve and are proud to be ‘Responsible in everything we do’. Education is key and so all staff, Tour leaders and partnering suppliers are trained in responsible and sustainable tourism. At our UK Head Office, we continually strive towards a sustainable and planet-friendly working environment, including having solar panels installed and a company commitment to reducing our plastic usage. As well as this, we have valuable and longstanding partnerships with UK charities Toilet Twinning and Send a Cow, plus many smaller initiatives and projects around the world. We’re members of UK travel industry bodies Tourism Concern and AITO because we believe it’s important to share our knowledge and experience, as well as learn from other operators. We acknowledge that air travel has a negative impact on our environment, so we work together with Cool Earth to offset carbon and protect our important rainforest. 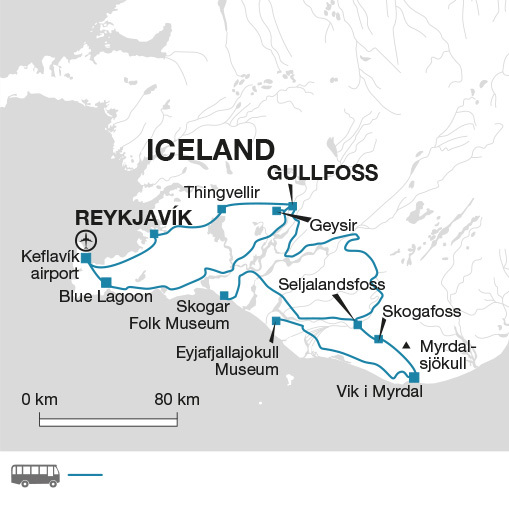 During the trip we visit the Skogar Folk Museum for a real insight in to Iceland’s history and culture. This fascinating museum charts the fishing and farming industries that are the foundations of this island. With no natural harbours on the countries coast fisherman hard to work extremely hard to even launch their boats, let alone deal with the rough Atlantic Ocean. The open air section is a highlight with traditional grass topped houses that you can enter and wonder how anyone ever managed to live in such a small place. We spend two nights in a small, family run hotel in Gullfoss. This simple accommodation is perfectly located away from any towns to ensure light pollution is kept to a minimum, essential if you want to see the Northern Lights. As well as a great breakfast the hotel’s chef serves up traditional Icelandic fare in the evening with locally produced lamb, wild Atlantic salmon and potatoes and vegetables grown by local suppliers and ensuring our visit helps boost the local economy.